!! OMG, how time-consuming: Morph Thing !! I just found a new way to procrastinate – MORPH THING. You can morph celebrities together, or your own face with celebrities, or your face with your cat’s face if you wanted. 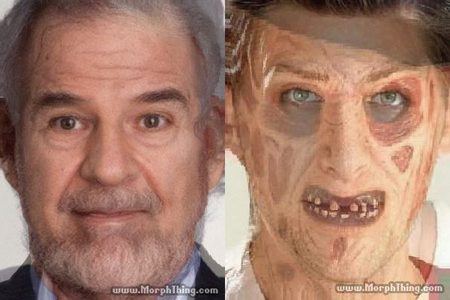 Above I’ve morphed Steve Martin with Saddam Hussein, and Lance Bass with Freddy Kruger. Although I don’t think the second one worked…that just looks like Lance Bass to me. 1 Comment on "OMG, how time-consuming: Morph Thing"
Wow, considering how desperate the blogs were to out Lance, they sure aren’t happy with him for being… out. Seriously, it’s almost Lord-of-the-Flies like, the hatred for Bass that really has no justification.